In their first game under defensive co-ordinator Don Martindale, the Baltimore Ravens couldn’t draw up a better scenario. Centre Eric Wood was forced to retire after being diagnosed with a career-ending neck injury. Left guard Richie Incognito, who played a key run-blocking role, forced his way off the roster after having second thoughts in agreeing to restructure his contract. Ryan Groy takes over at centre and Vladimir Ducasse replaces Incognito. That bodes well for a Baltimore defence that last year led the NFL with 34 takeaways. The unit did, however, have trouble closing out big games – most notably a 31-27 loss to Cincinnati in the finale that enabled the Bills (9-7) to displace Baltimore (9-7) in the AFC playoffs and end a 17-year postseason drought. Martindale promises to unleash an aggressive defence that could prove troublesome to the untested Peterman. Bills running back LeSean McCoy has been elected team captain in his fourth year since leaving the Eagles. “I look forward to having a C on my chest Sunday,” he said. 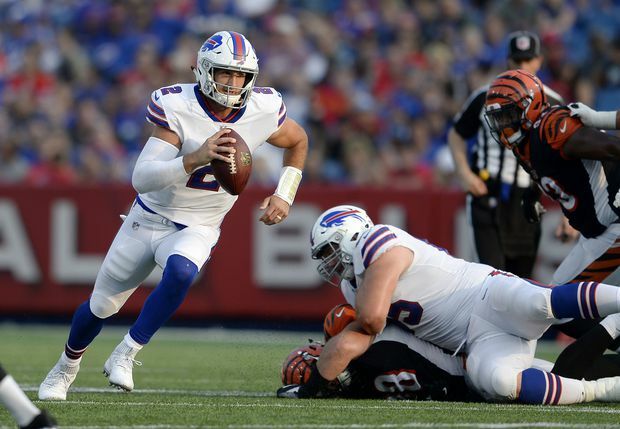 A strong ground game can take the pressure off Peterman: McCoy ran for 1,138 yards last year, fourth most in the NFL, and can move into sixth place on the team’s career list with 69 yards against Baltimore. Buffalo’s best chance to win is making this a low-scoring game. The Bills finished 26th in yards allowed last season but were 18th in points against, despite yielding a combined 111 in successive losses in November. Including playoffs, Buffalo was 9-2 when allowing 17 or fewer points. The two losses can be blamed on the offence: 9-3 at Carolina in Week 2 and 10-3 at Jacksonville in the AFC wild-card playoff. Ravens linebacker Terrell Suggs, who turns 36 next month, can’t wait to get started on his 16th NFL season. “I start to get shy or flattered when I hear Year 16,” said Suggs, the franchise leader in sacks. “It’s a pretty long time, but as long as you know you’re still a kid at heart, still out there running, having fun, playing football . that number only means something to y’all, not really too much to me.” It does, however, mean a lot to his teammates. “He’s a legend,” Weddle said.